This concept dates back to Roman times, and is simple an effective to make, not to mention less flammable and less toxic than petroleum or kerosene if spilt - making this lamp ideal for camping or use in small spaces. We recommend using pure olive oil, as it will produce no smoke when burning and burns at a rate of about 1/8 cup for 5 hours. Form one end of steel wire into a hook, and the other end into a loose coil, about 1.5 inches in height. Place the wick in the coil, leaving a quarter of an inch exposed. Pinch the end of the coil to secure your wick. Place the coiled end on the bottom of your glass jar, and secure the hooked end to the top of the jar. This holds your wick in place. Pour in enough olive oil to sit just under the top of the steel coil, no higher or you risk putting out your flame. Pour a small amount of olive on to the tip of the exposed wick to speed up soak time. 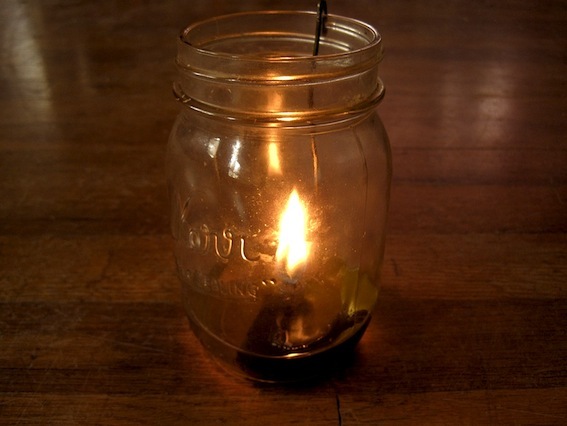 When wick is fully absorbed, light your wick. Olive oil is not nearly as flammable as petroleum, so it will take slightly longer to light. This same fact ensures that if the lamp is spilt it will not ignite.